Shiva Ek Yuva Yoddha is an upcoming Marathi movie set to release on 15th February 2019. Shiva is starring Mr. Asia Siddhant More, Yogita Chavan, Sonpari fame Tanvi Hegde, Milind Gunaji, Sunil Godbole, Prakash Dhotre, ‘I’ Movie fame Kamraj and Jeet More in prominent roles. It’s a Vijay Shinde directorial film. Story is written by Dr. Sanjay More. Screenplay and dialogues are written by Navnath Pawar. Shiva is produced by Dr. Sanjay More, V. D. Shankaran and Ganesh Darak. Songs are penned down by Babasaheb Saudagar. Melodious singers Kailash Kher, Swapnil Bandodkar, Rupali Moghe, Krushna Bonge, Sagar Phadake have given their voices for the songs. Shiva is a story which can be relatable for anyone. It’s a story of Shiva within, a power within. 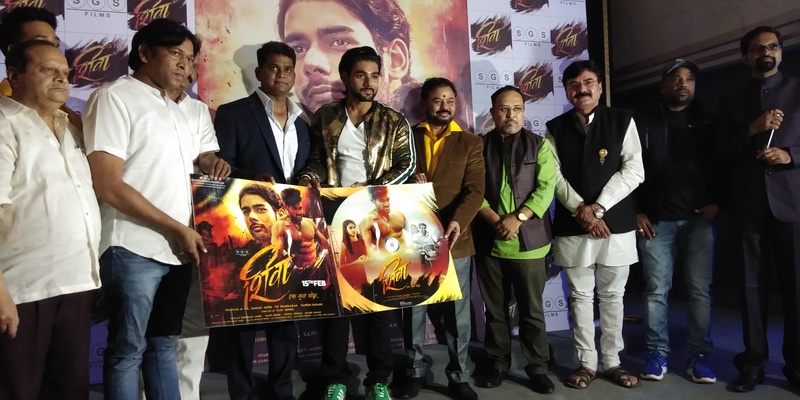 Shiva’s trailer and Music was recently launched on 22nd January, 2019 at Mumbai in the presence of the team; where all of them expressed their views and experience of the film and presented the trailer and music in front of media. On this occasion we have some sneak peeks for you. Let’s enjoy few glimpses and few moments from this event in the video above. Also we had a little chat with Siddhant More and Dr. Sanjay More. Let’s see what they have to share with us. And don’t forget to like, share and subscribe our official YouTube channel MarathiCelebs_Com.